Autumn brings cooler weather, and the roses perk up, blooming like spring again for a few short weeks. Since the weatherman is predicting freezing nighttime temperatures, I decided to take some last pictures of my roses for this season. 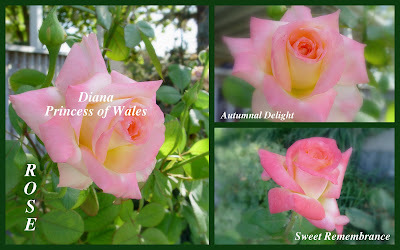 The Diana, Princess of Wales rose by my back porch is my all-time favorite. Its soft colors blend together beautifully and represent the "People's Princess" so well. Enjoy the last of the season as we look forward to the one ahead. Very lovely! Such a great pink. It's a lovely rose, as was the Princess! I have always wanted to grow this rose. Now you have inspired me even more. Lovely collage. I really like your "new look" on the blog! Oh how inspiring...it is my hope to start up some roses soon.